Style and functionality go hand in hand when it comes to this backpack. It made of high quality lightweight water-resistant nylon fabric. It goes with everything and looks very stylish. Multiple pocket is perfect organizer for your daily essentials, smart phone, keys, lipstick, makeup staples, sun glasses and other must-have things. It is roomy, easy to carry and very practical. Besides, the back pocket is to protect all your valuable items and provide privacy, which is anti-theft and reliable. And the shoulder strap is adjustable that make you more comfortable when carrying. In addition, easy to match with your any garments, the backpack will be a stylish and useful item into your wardrobe. Features:- High quality nylon fabric and polyester lining. Please note:Little smell is normal, keep it airing out for few days, the smell will disappear;Purchasing Notes: The actual color of the bag maybe different from the picture shown due to the different screen of display or reflecting light when shooting. 1-2cm error of measuring is a reasonable range due to different measurement methods.If you have any questions about our product, please do not hesitate to contact us. 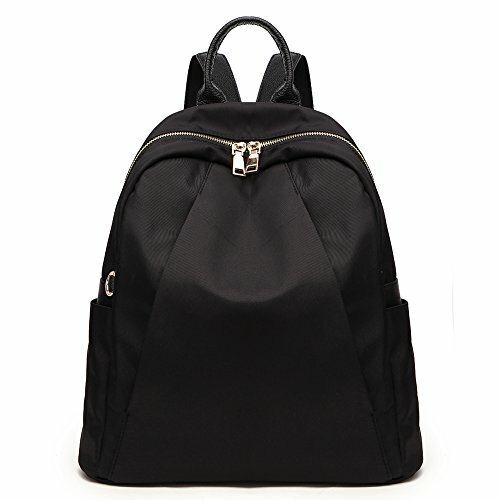 MATERIAL OF BACKPACK: Material updated to good quality nylon and leather, Full-lined Polyester Cotton lining. Clear fashion texture, with simple styling backpack. LARGE CAPACITY and DIMENSIONS: 13(L)*6.7(W)*13(H)inches. 1 large zipper Main pockets with a hole of the headset, 2 front zipper bevel pockets, 2 open side pockets and 1 back zipper pocket. Main zipper section contains 2 open pockets and 1 inner zipper pocket. Main zipper pocket can hold A4 size books and ipad Air. PRACTICALDESIGN: Zipper closure,with High quality smooth Gold color double zipper, 2 adjustable nylon back straps prevents sliding off your shoulder. Top Loop Handle made of leather. FITS DAILY USE : Pockets can hold your Smartphone/clothes/books/wallet/umbrella or water bottle and other essential items. MULTIPURPOSE: School College Backpack,Travel Bag,Casual Daypacks,It will be a perfect school bag for Women,Girls. Also perfect for dating, short trips, yoga, shopping, gym sports, or other outdoor indoor activities. If you have any problems about our item, please contact us. If you have any questions about this product by Joda, contact us by completing and submitting the form below. If you are looking for a specif part number, please include it with your message.